This image is best viewed at PBase "ORIGINAL SIZE". This enormous quartzite block, weighing about 16,500 tonnes and measuring about 41 x 18 x 9 metres, was carried here on the surface of a glacier. It came from the Rocky Mountains in the Jasper area, probably between 18 and 10 thousand years ago. Rocks moved many kilometers from their original location by the ice are called “glacial erratics”. Big Rock began its journey when rockslides in the mountains deposited quartzite debris onto the top of a glacier in the Athabasca River valley. The glacier carried the rocks with it as it flowed slowed eastward to the plains, until it collided with the Laurentide ice sheet. This massive ice sheet deflected the glacier to the southeast, parallel to the mountain front. When the ice melted, a string of erratics was left in a narrow belt extending from Jasper National Park along the foothills to northern Montana. 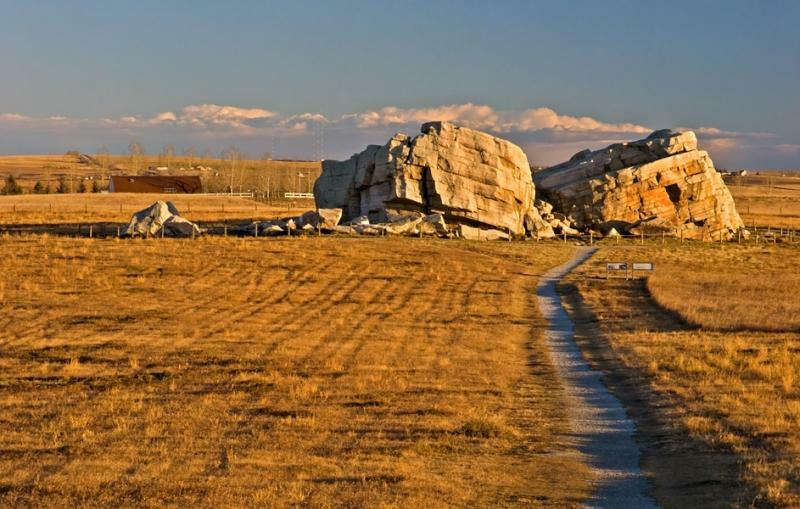 This group is known as the Foothills Erratics Train, and the Okotoks Erratic is the largest member. The name of the rock was derived from the Blackfoot word for rock: okatok. Hey william Matijiw - you ever think about the family you left 25 years ago? This is a very nice picture. I've been in Alberta many times (I'm a long distance semi truck driver), but never in this area. I've never been in Boston either. I've been in Maine, driving a Semi truck through it, to New Hampshire. You might like to Google, Boston Tourism, and you might like to Google, Baltimore Tourism. I live in Okotoks and get to drive by the rock everyday. You never get tired of looking at it. Beautiful picture and very good description, thanks. I love the colors, how the light really makes these glacial erratics glow. The geologist really enjoyed your description. Very interesting. They look like they fell out of the sky. Nice job. I am quite enjoying your Alberta prairie sequence Gary. Well done. Golden image. Excellent history lesson! Well done! Beautiful! I like this even better than the other.....well done. Very interesting rocks and a wonderful light!